Are you tired of spending hours manually entering book titles into your own personal database? (Well, okay, if you’re not a home-schooler, maybe you’re not, but work with me here.) If you’re like us, you spend a lot of time going to the library to pick out books for your kids, and, let’s say for the purposes of this discussion, you also spend a lot of time keeping track of the books they read in some sort of database. What if you could just scan the books, like they do in the library, and have them magically appear in your own database? Well now you can! For about $20, and the time it takes you to download a spreadsheet, you can automate this entire process and free up your time for things you really want to do, like reading my blog! First, crank up that Prime membership and order this barcode scanner from Amazon. 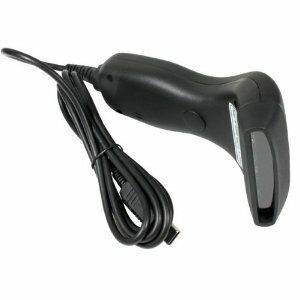 There are scanners that sell for hundreds of dollars, but you don’t necessarily need to spend that much. This scanner works very well, although you might find it a bit challenging to configure. You will get hours of entertainment trying to read the user’s manual (written in chinglish), but all you really need to change is the default interface to USB, and enable ISBN scanning. Next, you will need to create a free account at ISBNdb.com, which is a database of virtually every book in the universe. Once you have your account set up, you will need to generate an access key. Once you have a key, write it down. You will need it in the next step. Finally, download my spreadsheet containing a macro that I wrote that will take an ISBN as input (either from the barcode scanner or manually entered) and then automatically query the ISBNdb.com site and automatically fill in the book title and author. Enter your access key in the spreadsheet and start scanning! It couldn’t be easier! Now if we could just get the library to deliver. I feel like this could be done with a smartphone without having to buy the scanner hardware. Apps like Google Goggles do visual processing like reading barcodes. I don’t know how you would be able to tap into their API to do what you’re trying to do, though… But your solution sounds pretty good as well…and probably easier. I’m trying your macro and I ordered the scanner from Amazon. I saw your post on The Libertarian Homeschoolers FB page. Hey Marla, that’s great! Let me know if you have any problems with it. Well, I’m already back. It’s not populating some of the book titles although it has retrieved the author every time. I am entering the ISBN by hand. It found everything for 978092527917. It did not get the book title for 0385321163 or 0698119207 and a few others. I don’t have a scanner yet. Any suggestions? That fix worked on 10 out of 11 books. I’m pretty happy with that. Thank You! !